I am interested on the value of touch screens on scopes from those who actually have scopes that support it. Do you use the on screen touch panel where there are physical controls, or do you tend to use the physical controls? I believe that some touch screen scopes have multi touch gestures, like stretch. Again, are they any use or do you tend to use the physical controls? Regarding touch-only features like Zone triggering: it sounds like a nice feature, and looks like it's nicely implemented on the Keysights, but realistically how often do you use such a feature? Would you care to make other comments on the touch screen capabilities, particularly comparing it to the non-touch counterparts. I'm particularly thinking about the user interaction with the screen being vertically in front of you on the desk, more akin to a PC monitor than a tablet that you tend to use horizontally on your lap or table/desk. There had been some commentary about the ergonomics of touch screens for a traditional desktop use with Windows 8, liking it to a gorilla poke. Certainly although I use Windows 8/8.1 and have done almost exclusively since it came out, it is mostly in a non-touch desktop or laptop on desk environment. I only use the touch screen when I'm using it as a tablet on my lap. In short, on a scale of 1 to 5, with 1 being "what touch screen" to 5 being "I couldn't live without it" what do you give the value of a touch screen on a scope? I can't provide much value as I've only had my DSOX3000T for a few days now. I probably just haven't gotten used to it yet, but although the touch system is very well integrated and snappy, it kinda feels like a gimmick. I keep forgetting to use it and reach for the hardware controls almost every time. This may change as I get more used to it. One thing that I do like, is the ability to drag around and re-arrange the side panels. That is quite useful. Anyways, sorry I can't provide much more than that as my experience is limited. I evaluated a few touch screen scopes for a month or so; personally I found that with the 4000x agilent scopes the touch screen worked well, but it didn't seem to make many operations easier aside from re-arranging a few display items. I didn't really feel it added much to the overall experience and wasn't something I'd pay for. I did also evaluate a Rohde and Schwarz RTO scope, I forget which model. On that you had things like live thumbnail display of all the channels, including the ones which were disabled. Then to activate them you could just drag them in and you could rearrange all the bits on the screen very quickly. This is particularly useful if you've got lots of channels as you'll often see people who have all the channels stacked on the screen-because of the scaling this means that you aren't using the full dynamic range of your scope and are losing resolution. All the equipment at workplace has already dirty-disgusting controls, because no-one cleans it, now I can imagine it with touchscreens. No thanks. Maybe for home, I doubt that is their main target. off topic: I still cannot believe the IT guy wanted to give me a used headset. Well, I predominantly use high end scopes that these days all have touch screens, so hopefully my input is of value to you. That depends on what I want to do. For most of the basic settings I use the front panel controls, but there are occasions where I just want to enter a specific value (i.e. 10mV/div), and then I use the touch screen. In addition, the scopes I usually use come with pretty advanced analysis functionality, something which is impossible to control via a few front panel buttons (unless you'd like your scope to come with hundreds of buttons). I use the touch screen, simply because it's much quicker and simpler. I guess you think about Keysight's entry level scope DSOX3000T, where Keysight highlights zone triggering as a top feature. Fraonly, I'm not sure how useful this is. I do use advanced triggering regularly (i.e. parameter triggers looking for specific signal parameters or deviations), and on the scopes I use this is controlled via the touch screen. But on the low-end DSOX3000T it looks more like a marketing gimmick. At the end of the day, the DSOX3000T is a DSOX3000 with tacked-on touch support, and from what I've seen it looks and feels that way. It's more an attempt by Keysight to milk this old scope platform for a while longer. Well, that's difficult to say in general terms, as the touch implementations of the various manufacturers vary a lot. For example, Keysight's scope UI for their high-end scopes, while having improved, has its origins in the old Infiniium 54800 Series and even in this day shows that it's an interface originally designed for mouse control and not touch, with touch a tack-on. It's good enough, but not great. For Tek's UI it's roughly the same as with Keysight. Usable but not great, and clearly designed with mouse control in mind. LeCroy's touch UI on their X-Stream scopes on the other hand is very good, but then LeCroy has designed it from the ground up as a touch UI (in fact, LeCroy was the first big brand to come up with a touchscreen scope when they brought out with the WaveMaster 8000 in 2001, and all mid-range and high-end scopes since then are touch based). They also have the most consistent UI, which means if you know how to operate a WaveMaster 8000 from 2001 then you can also operate a modern-day WaveMaster 8zi, WavePro 7zi or any other of their touch based scopes easily as the UI works the same. R&S has touch interface in their RTO high-end scopes. I've seen a demo of it and then had time to play around with it for a few minutes only. However, the UI feels the same as the UI for other modern R&S gear, which is somewhat convoluted and illogical. They can do some nice tricks on their UI (i.e. multi-grid screens can be created quickly), finding the right settings can be a chore, and the many tricks of this UI worked much better on the connected Full HD projector than on the small XGA screen on the scope. On a Keysight or LeCroy scope I'd happily use the touch screen as it's quick and efficient, but on the R&S RTO I'd probably try to stick to the buttons as long as possible (a lot of stuff can only be configured via touch). But I'm sure if I had to use the RTO every day then I'd get used to it's UI at some point (well, I did with my FSP7 spectrum analyzer, which also doesn't have the best UI). A scope is no desktop PC, you hardly write letters or do other things that requires very extensive inputs on it. Plus, the screen is normally at the same distance from you as the scope's controls, so it doesn't matter much if you have to lift your arm to turn a knob or poke a screen. I'd say a "2". Wouldn't say I can live without it but it would be a pretty big loss. But again, that's for a LeCroy or Keysight scope. All the equipment at workplace has already dirty-disgusting controls, because no-one cleans it, now I can imagine it with touchscreens. No thanks. Well, scopes are not tablets, that means they don't have the shiny glass surface that keeps fingerprints so well. All the touch screen scopes I've used have matte screens with protective sheets, and unless you had your fingers in a barrel of crude oil before you'll rarely see any smears on the screen. It's funny you mention tablets. 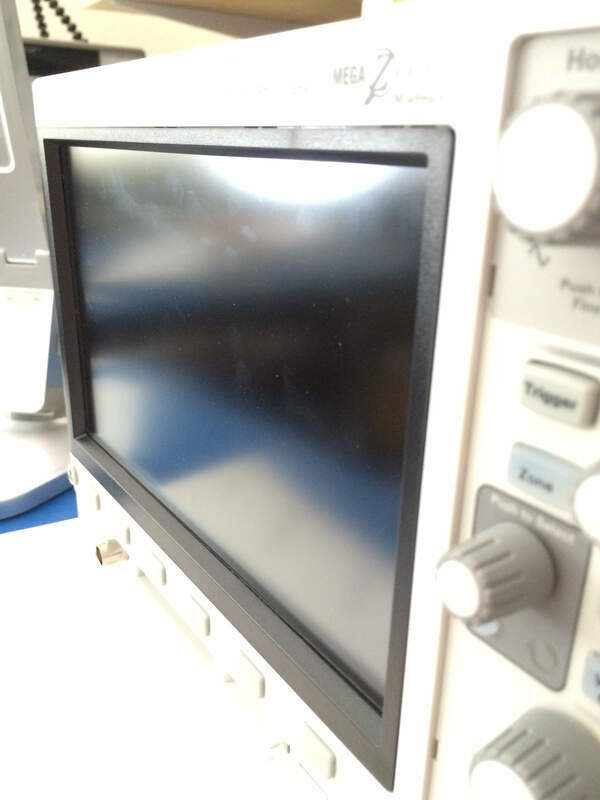 Has anyone ever had the chance to try a Micsig tablet oscilloscope (this oscilloscope is touch screen only)? They seem to be available from various test equipment dealers. I tend to agree that as you're already reaching up for the scope to do an adjustment anyway, then there's not a huge amount of difference in doing that on a physical control compared to doing a touch screen gesture, other than the lack of tactile feedback. The key I suppose is a very responsive UI: any lag in a touch UI is going to be an irritation as there needs to be some sort of other immediate feedback without a tactile response. I can't say in recent times I've needed to use pooled equipment much if at all, so the thought of a smudged screen hadn't crossed my mind. I have seen some pretty grimy controls on some scopes in my time though. I did hook up my older Infiniium scope to an external touch screen a few months ago to see how I liked it but it wasn't really for me. It didn't support gestures, just menu selection and button prodding. I found myself using just the keyboard and mouse that's in in a pull out shelf right under the bench, it works perfectly well, is natural to use, and takes up no bench space. Anyway I welcome further comments. I would have to re-learn some things! Back in the 1990s,Tektronix made a Waveform Monitor/Vectorscope with a touch screen. In our TV Studio,one of these was displaying a field rate signal,which had a clamping problem. I pointed it out to a colleague,placing my finger on the screen to do so. OOPs! The @###$$!!! thing changed to a Vectorscope display. May be it was one of these? No,a bit later,& a fair bit smaller screen,probably the same technology,though!